Think Child – Think Safeguarding. The school has been given the opportunity and are taking part in a project that will run jointly between schools and the Metropolitan Police Service. This project is known as Operation Encompass. 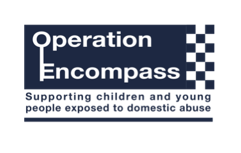 Operation Encompass is the notification to schools that a child (under 18) has been exposed to, or involved in, any domestic incident. This will ordinarily be done by the start of the next school day. Operation Encompass will ensure that a specially trained member of the school staff, known as a Designated Safeguarding Lead (DSL), is informed. The DSL can then use the information that has been shared, in confidence, to ensure the wellbeing of the child. The school may be able to make provisions or adjustments to assist the child and their family.